In this short case study we show that within a regional equity universe diversification is achieved by combining independent strategies. Sharpe ratios can increase significantly even without a weighting methodology or an overlay for explicit protection. 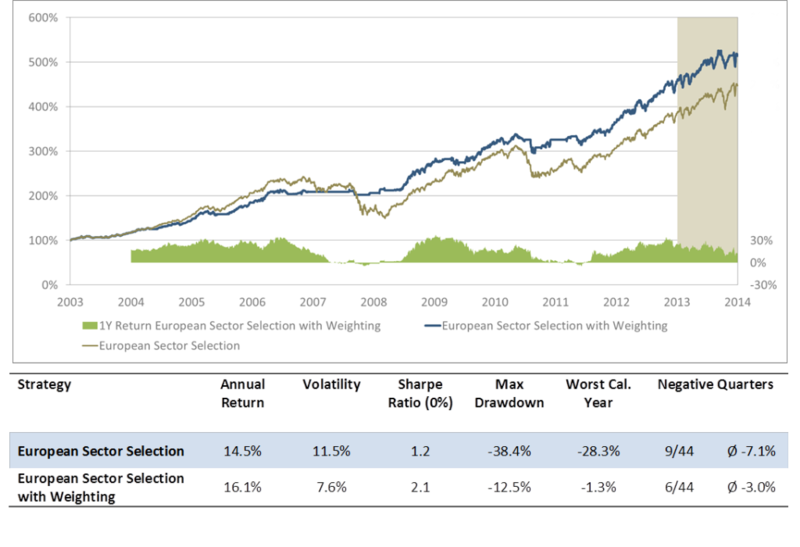 The European supersectors derived from the STOXX Europe 600 is the investment universe of choice in this case study. On the one hand, the index is broadly diversified, aggregating single stocks from 16 European countries with five different currencies. On the other hand, with 19 supersectors we find enough instruments for a meaningful selection and concentration in a portfolio. Another advantage of these sector indices is the availability of vehicles (e.g. ETFs) that are optimized based on the liquidity of the underlying stocks, a factor not to neglect for implementation. Three different strategies are combined for diversification. Most important is that these strategies are independent from the perspective of why certain sectors are selected. Each strategy has its own systematic selection criteria. This does not automatically mean that the aggregate selection leads to lower correlation in every time period. The aim of diversification across strategies with different risk-return characteristics is to achieve improvement on performance measures in a portfolio context over a mid- to long-term horizon. The Sharpe Ratio is one such measure but others like return divided by maximum drawdown can also paint a good picture. For the first strategy, a risk on/off approach, a metric is calculated that indicates if current market performance is supported by sectors assumed to be risky or by those assumed to be less risky. The second strategy is rather simple trend-following, selecting sectors with momentum compared to the universe. The third strategy is a low volatility approach. Within a portfolio context it partly compensates the higher volatility and higher risk of the two other strategies. For the low volatility selection, we start with grouping the 18 sectors into volatility clusters. As we do not use any forecasts, historical/realized volatility is calculated to determine the clusters. From those clusters always two sectors find their way into the portfolio. Although both sectors can be counted as low volatility, for certain periods of time they reveal very different return drivers. The sector selection takes place only once a month with no more than 50% allocation to any strategy. Characteristics of this combination without an overlay or a dynamic weighting decision are sound. With 100% long exposure only two years within the last ten calendar years exhibited negative returns. Obviously, these are 2008 and 2011. With -28% in 2008 the return was still more than 15 percentage points above the market return. The strongest improvement from strategy diversification is seen in returns and volatility. For example, after the 2008 crisis the momentum strategy captured the strong upward movement in the following year with twice the return as the low volatility strategy and the overall market. To not be fully exposed to directional market movements during the worst periods, a weighting methodology is added. A systematic monthly analysis of the trend environment for European sectors determines weights between 0% and 100%. Implementing the weights decreases the time with long exposure. For about 29 months or 22% of the time in the last 11 calendar years the combined strategy would have been out of the market. Over the whole period, the long exposure was 70% on average. As expected, the risk figures improve and at the same time returns do not decrease. By combining three strategies with independent selection criteria on the same universe, we highlight the benefits of strategy diversification on a regional equity universe. Aggregating different return and risk drivers into a portfolio context can deliver implicit downside protection without hurting the upside potential. To increase the probability of not being exposed to the worst market periods, a dynamic weighting scheme can be utilized to further decrease risk. 18 supersectors are considered for selection. Real estate is excluded. Subjective categorization of risk. Volatility is not the single determinant of risk here. Maximum drawdown and Sharpe ratio are included to group into risk categories. While for the risk on/off strategy higher risk is not necessarily displayed in the performance numbers (see table 1), we assume higher risk due to only selecting one sector compared to three selected sectors from the momentum strategy.